Doubly-terminated, tabular stitchmarked Arkansas crystal flares out [back? up?] at its' offset base with growth craters and growthmarks. 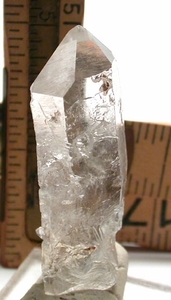 'Stitches' taken in all six prism sides from interrupted growth won't impede your ability to read through this clear crystal. A fine Isis face and a rare six-sided shield face on the opposite side, plus the features given above, suggest a healer's stone, a fine stone to meditate with. 3/8x +5/8x 2" long, no damage. Fisher Mountain, Arkansas.